We have 2000 War Thunder: Ground Forces keys and there’s only, like, eight of us. Want one? “This is war”, thunders the latest Ground Forces trailer, fittingly. It transpires war doesn’t resemble men in red walking up really steep hills as in Total War: Rome II, or military types slip-sliding their way through gaps in the terrain in Warface – nor even Jedi /dancing their way to safety under laser fire in SWarTOR. No: war is flying through the debris of your comrades to get uncomfortably close to your target tank on the ground; it’s trees bowing respectfully beneath the blast of dropped bombs; it’s colliding nose-first into an enemy dakka, apparently. This is the sort of stuff you could be getting up to in War Thunder’s Ground Forces beta, if only you had a key. If only there was a way. Plonk an email address in this here box for a chance at a key. You don’t have to comment – though feel free to debate the nature of war and what it really sounds like, etc. When we’re ready, we’ll pop over 2000 codes to 2000 addresses. Follow us on Twitter and Facebook to find out where we’re up to with the giveaway. If a key drops into your inbox, you’ll want to take it straight to the War Thunder site, where you can login or create a new account. After that, click the ‘Redeem code’ button on the right-hand menu. 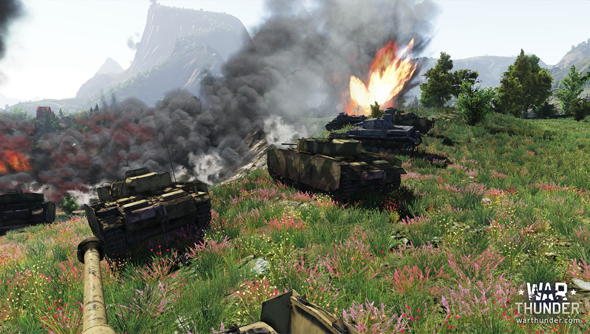 Tank events are happening twice a day on War Thunder’s main test server – the current event schedule sees them run from midnight to 4am GMT, and from 4pm to 8pm GMT. They’re visible in-game under the ‘Events’ tab in the upper-right corner of the screen – though they’ll only appear when active. Once Ground Forces hits open beta in the near future, you’ll be able to buy special packs of vehicles and the like via the official store. But for now, it’s a pay-free zone. Plenty of payloads, though. Have you been looking forward to dropping a bomb or three on other players?